Killamarsh Young Wives Cricket Team. About 1960. See note below. Photograph courtesy of V. Hopkinson. This is my mum, Gillian Beck (nee Frost) back row, second from the right and my auntie on the front row, far left Margaret Stevens (nee Frost). 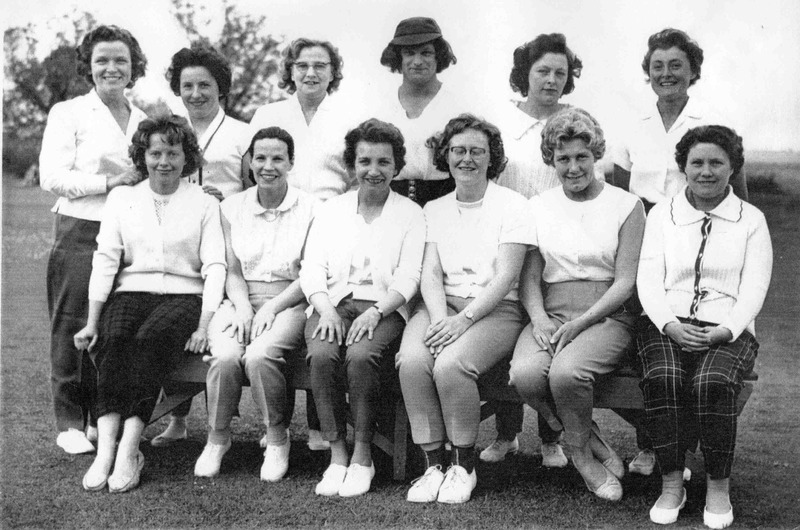 Killamarsh Young Wives Cricket Team – about 1960. Match played on Juniors Ground. Young Wives held weekly meeting in old Rectory. Founded by Mrs Joan Flint. Cricket match versus Juniors Cricket Team who had to bowl left handed and bat with one hand. Mr Bernard Flint masqueraded as a woman (4th from left on back row) and billed as Mrs X. Match marred by a bad injury when one of the Juniors’ Team fielded the ball with his eye! Names given – can you fill in the gaps. Back row: “Rusty” Edmunds, Joan ?, Ada ?, Bernard Flint, ? ?, Maureen Jennings. Front row: ??, ? Jones, ? ?, Joan Flint, Janet Maloney, Betty Maloney. the second lady on the front row is my late mother, Wynne Brown. We lived at the time on Chandos Crescent. Mr father taught at the time at Eckington. My two brothers and I went to the Rectory Sunday school. We left Killamarsh in 1964. The second lady along on the back row might well be Mrs Joan Howarth, whose husband was a senior manager/engineer at the Colliery. She and my mother remained in touch until my mother died in late 2010. Neil Brown (aged 3 at the time of the photo).